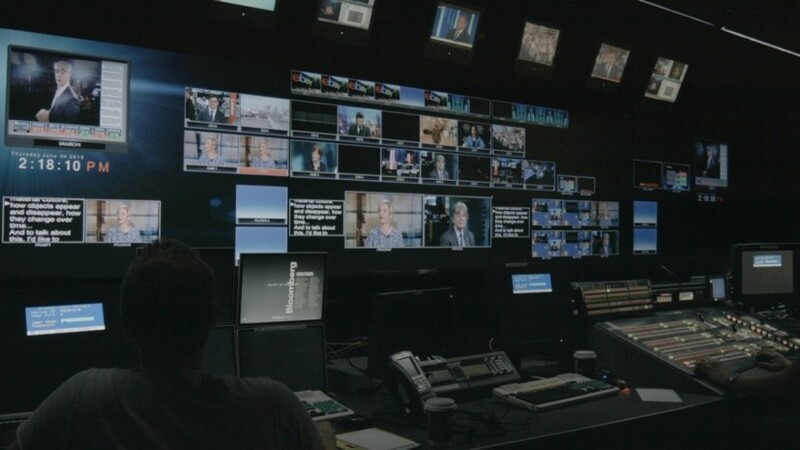 Melanie Manchot, THE GIFT (Control Room), still, 2015. Image courtesy the artist and Bloomberg SPACE, London. 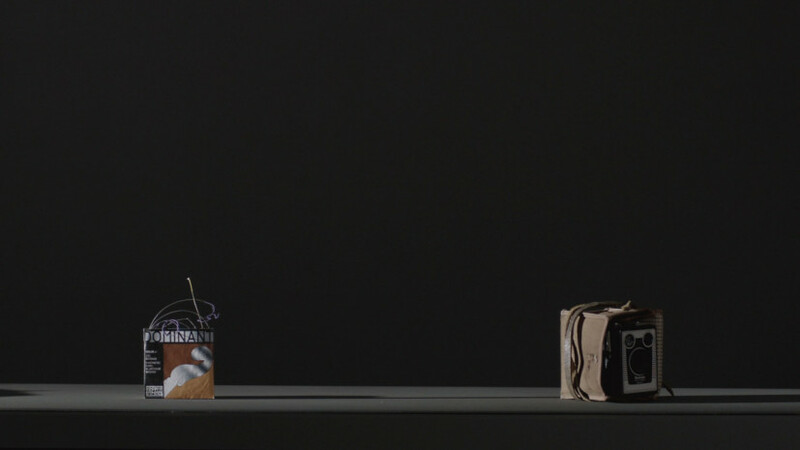 Melanie Manchot, THE GIFT (Conveyor Box Brownie and Strings), 2015. Image courtesy the artist and Bloomberg SPACE, London. Melanie Manchot, THE GIFT (Conveyor Hat and Vinyl), 2015. 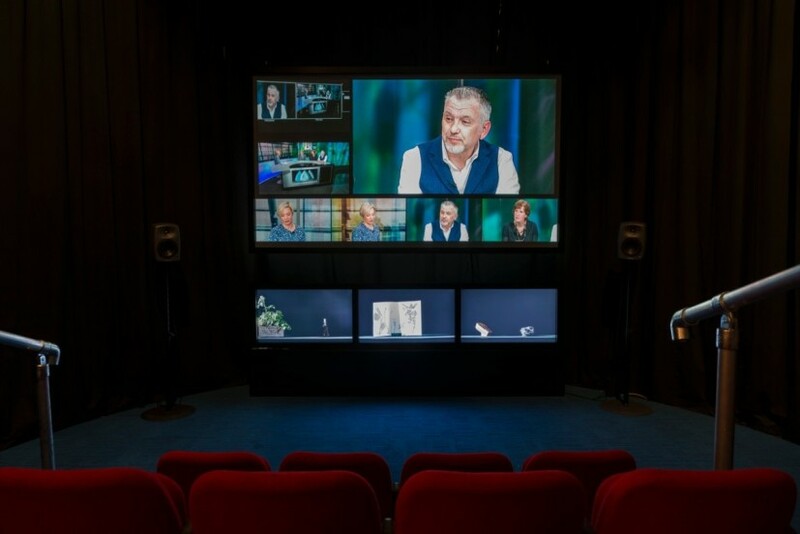 Image courtesy the artist and Bloomberg SPACE, London. 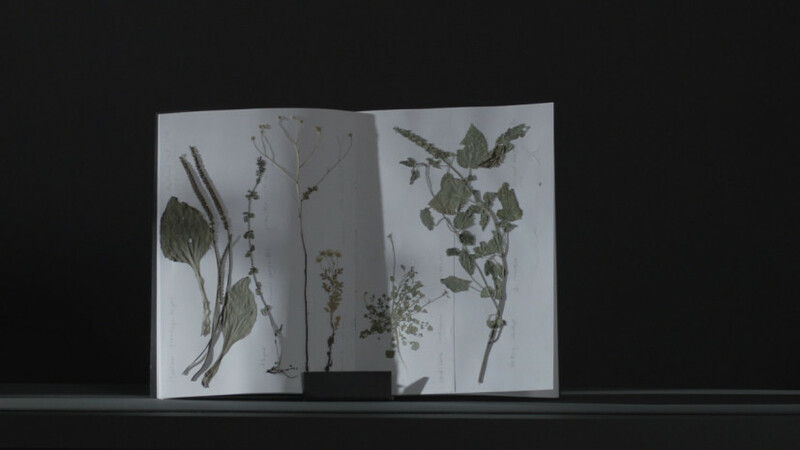 Melanie Manchot, THE GIFT (Conveyor Herbs), 2015. 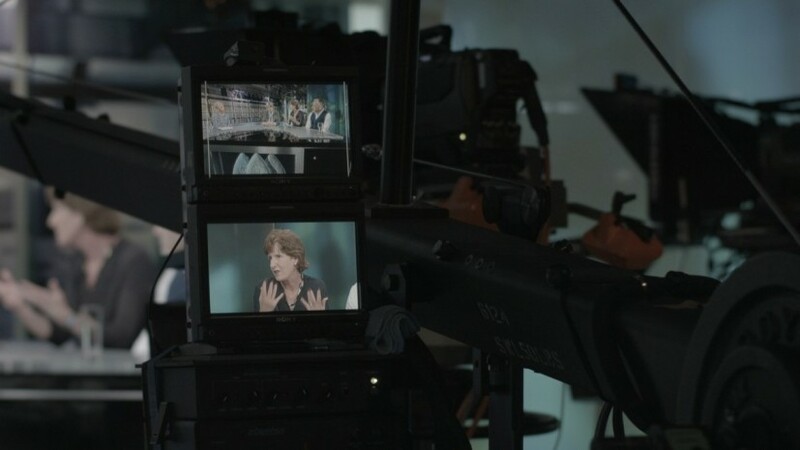 Image courtesy the artist and Bloomberg SPACE, London. Melanie Manchot’s new exhibition at Bloomberg SPACE in Finsbury Square on the eastern edges of the Square Mile has been almost two years in the making. As always with her work, it is based on a period of intense research, this time focusing on some of the lesser-known communities of London’s financial district. 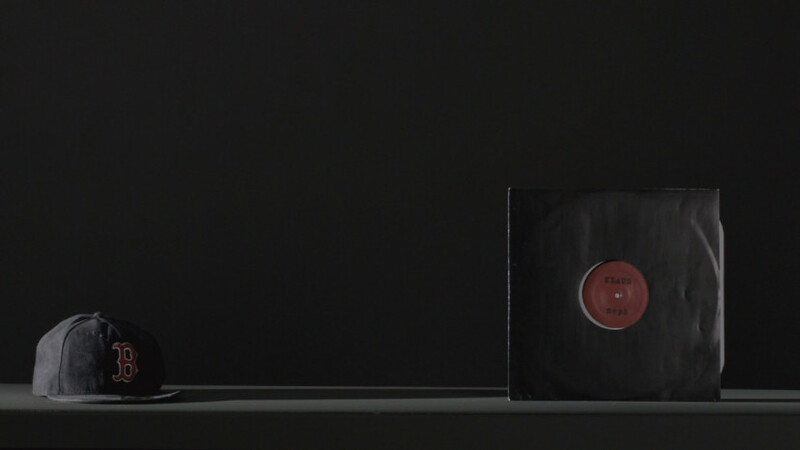 THE GIFT is densely layered with reference, borrowing from corporate culture and combining the grammar of TV news studios and chat shows, as well as Spanish still life. But at its heart it is a meditation on our relationship to material culture at this extraordinary moment, as we lift away from millennia of attachment to physical objects and head off into an immaterial, digital future. 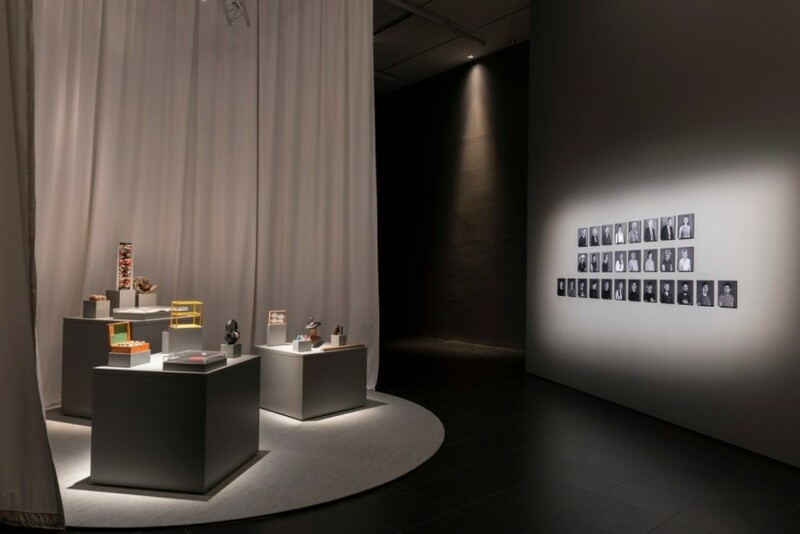 The title of the exhibition is taken from French sociologist Marcel Mauss’ 1950 essay The Gift, which examines the way the exchange of objects establishes relationships between people. As you enter the exhibition the first thing you see is three rows of black and white portraits. These are not illustrious former CEOs or the mergers and acquisitions team of a multinational, though the format deliberately apes that style. The top row are the only traditional tailors still making suits by hand in the Square Mile; the middle row are the gardeners that look after the (extraordinary statistic this) more than 200 public gardens in the City, and the bottom row are composers working at the Guildhall School of Music, specialising in electronic music. Their photographic portraits are expanded through a selection of objects associated with their separate professions, introducing the notions of our emotional and psychological attachment to things, as well as their symbolic function. On plinths in the space we find blue, red and white tailors chalks, essential tools for making a bespoke suit; pressed flowers illustrate an Anglo Saxon recipe for the Nine Herb Charm, which was used for the treatment of poisoning, and a tiny bird’s nest composed partly of teased-out cigarette filters from discarded butts and shreds of feather-boas from passing hen parties. It is extraordinary how powerfully evocative of the life of a place these objects can be. Beyond this area is a small auditorium space with screens set up to mimic the Bloomberg TV news studios of the floor above. 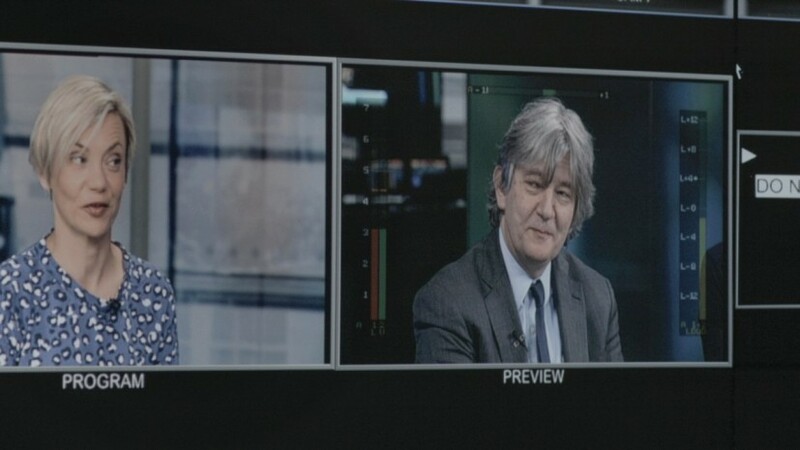 Manchot’s main film was shot in the Bloomberg studio by Bloomberg cameramen, and takes the form of a discussion chaired by Miranda Sawyer, with Deyan Sudjic, director of the Design Museum, Professor Susanne Küchler of the Department of Anthropology at UCL and forensic scientist Roger Robson. Running underneath the main screen, very much like the breaking news headlines, all the objects displayed next door pass before us starkly lit on a conveyor belt, against an inky black background. The discussion between Manchot’s assembled experts addresses the mass production of objects, the production line technology which all through the 20th century both enslaved the worker to the machine while at the same time producing goods of reliable quality that he could afford to buy. One is aware peripherally of the dematerialised flows of capital swirling through the City of London, and of the ‘service industries’ which have become our primary output in this country. The anthropologist describes the physical interdependence of the gardener and the garden, the forensic scientist speaks about the gardener’s tool, the spade, in terms of its potential as a weapon – an example of a simple pivot in the meaning of an object that couldn’t be clearer – and Sudjic recalls the trouble his museum encountered when it displayed a Kalashnikov, “Because there is this idea somehow that good design equals morally good”. With THE GIFT Manchot opens up a fascinating set of ideas and questions that rightly ask us to pause and consider the significance of the profound changes we are living through – before we download an app to navigate us across town, or pluck a film or a book out of the ether, or text some news to a friend and realise that ‘putting pen to paper’ has become just a metaphor. And I won’t even begin to talk about curating and Instagram.